Which gives you more power and a better overall value: an electric impact wrench or an air impact wrench? Learn the pros and cons of each. There are three types of impact wrenches available for use by the general public, the electric impact wrench, the air impact wrench, and the cordless wrench. The electric and cordless impact wrenches often look and function in the same way, and can be considered together as one, while the air impact wrench is a completely different affair. Before air or electrical power was available, the manual version of the tool was the only option. 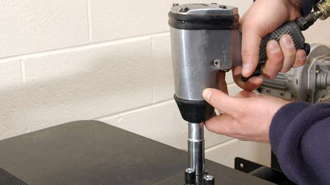 A manually operated impact wrench is very similar in appearance to a screwdriver. It can be put to use with the help of a hammer. Although you will be able to complete your repair work with the help of a manual impact wrench, you're better off purchasing air powered or electric ones that are less time consuming and easier to handle. The air impact wrench is the traditional tool of the auto mechanic. These tools use compressed air to power the wrench, so you need to either have a direct connection to an air source, or a bottle of compressed air attached to the tool itself. Modern air impact wrenches have been designed with an ergonomic layout, which reduce the amount of stress on the user, despite hours of work. On the downside, the wrench is very powerful but hard to regulate. You may be able to remove large, over tightened or rusted bolts, while being unable to move small pins or other delicate objects. If you are looking for a traditional tool, that will allow you to work for long periods of time, then the air wrench is a good choice, but if you may need a wrench which can operate at several different levels, or if you don't have room for a compressor, then you may need to look at the electric impact wrench. The electric impact wrench, either wired or cordless, has become very popular in recent times. The corded wrench has a similar speed and capacity to the air impact wrench, and they are also capable of removing large screws. The downside to the corded electric impact wrench is the electrical cable, which may prevent ease of movement into another location, and can make the tool very heavy. Some modern electric wrenches are cordless. The cordless wrench has fittings which allow you to remove small screws, rather than just large bolts, and is much smaller than a drill equivalent. They are perfect for use in confined spaces, such as you may find when trying to restore a car. On the downside, they may run out of power quickly, forcing you to wait while the battery recharges, and they are less powerful than the air impact and corded electrical wrenches. If you need a quick, simple tool to do infrequent small jobs, then the cordless impact wrench is ideal, but if you need something which can work for long periods of time, and on larger jobs, then you should consider an air impact wrench. There are a range of impact wrench accessories which can be used for common automobile repairs. Different size sockets are a welcome accessory for your tool. These sockets can alter the size of the wrench, so you can screw or unscrew a range of different size nuts and bolts. You can buy the individual sockets separately, or as part of a set. Socket sets can be bought in carrier boxes, and are considerably cheaper than purchasing them on an individual basis. The drill chuck converts the impact wrench into a hammer drill, so you can use it for drilling into tough materials like concrete and stone. Universal joints allow the tool to be used around corners, and give it greater flexibility in tight spaces. The joint is maneuverable, which means that you can plug the joint into the item being unscrewed, position the connection at the proper angle, and then attach the impact wrench, rather than having to manhandle the tool in a small area. These joints can make working much simpler and easier. Like the joint, the extension gives the impact wrench greater maneuverability, so you can reach into spaces that the tool would not otherwise be able to go. The extension simply fits on the anvil like a socket would. It has a secondary anvil on the extended end, so you can set the socket on the extended anvil use the impact wrench in the normal way. If you use a cordless impact wrench, you need at least one recharger and one extra battery to keep the tool running for as long as you need it. We can help you sell your car for FREE.